Pre-heat the oven to 200 degrees fan-forced. Smear 1 tbsp of olive oil over a baking tray. Pat salmon fillets dry with a paper towel then lightly season both sides with salt and pepper. Place them on baking tray and drizzle over with remainder of olive oil. Place trimmed asparagus on the baking tray with salmon. Season also with salt and pepper. Meanwhile, in a bowl, mix the chives, parsley, and tarragon. Sprinkle all but 1 tbsp evenly onto the salmon cutlets. Reserve the rest of the herbs for later. Roast salmon for about 12-13 minutes or until the middle is rosy. Let rest for about 2 minutes before serving. The asparagus should be nice and crisp by this time as well. 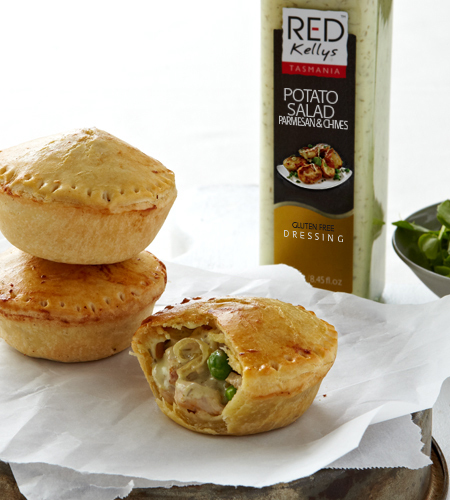 Pour Red Kellys Lemon & Oregano Dressing into a bowl with the remainder of the herbs and whisk lightly. Drizzle the dressing over the salmon. If you prefer more acidity, squeeze a little wedge of lemon over salmon before serving. Enjoy! You could line the baking tray with some foil for much easier cleaning afterwards. 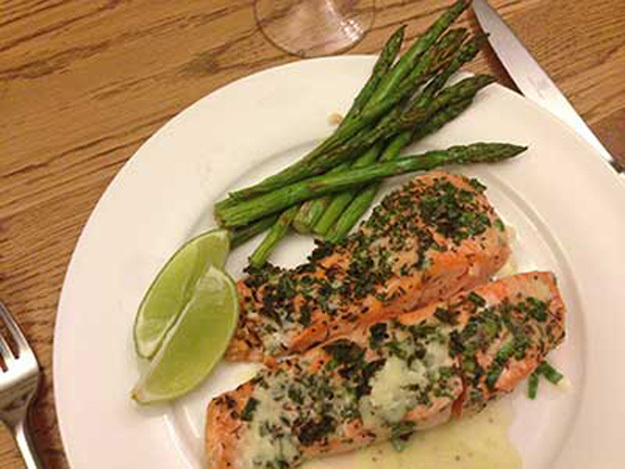 You can bake salmon fillets at a lower temperature however do remember to increase the cooking time. A dressed salmon needs slightly longer to cook. To test whether salmon is cooked, do this at the minimum baking time by inserting a fork into it and gently twisting. If it flakes and gives out an opaque milky-white juice, it is done.